What is a hotel? Look, here’s one: it occupies a whole neighborhood, prodding the cumulus clouds with its helipad. Here’s another one. It’s squeezed in between modern buildings, and even when your GPS announces that you’ve reached your destination, you’ll be pressed hard to find the entrance. The battle between industry and family business has been raging in the hotel world for more than a century and The success of large scale is inevitably followed by the victory of the tiny. It will take you an hour to walk around downtown Ljubljana. That is, if you walk slowly, taking in every little detail. Everything of importance is squeezed here into the space of a small football field. But it would be a shame to miss anything — the embankment with its willows and coffee houses, the castle on the mountain, the rather overgrown park. A prestigious new Antiq Palace Hotel & Spa in Ljubljana looks like a mansion because it is a mansion built for a wealthy Austrian family as their residence during the World War I. Nowadays it was converted into a hotel, that suits all tastes and budgets and gives a distinctly boutique hotel feel. A welcoming little lobby with lots of nice touches: two storeys with attics, three-hundred-year sold original frescoes on the high ceiling, crystal and wood, tapestries and modest gold coating. Hotel has a range of tastefully decorated rooms with huge wooden beds, luxury caprets, beautiful paintings on the walls and unique pieces of furniture — everything is like it was under the Habsburgs, when the house was already more than one hundred years old and had to be renovated according to the demands of Austro-Hungarian chic. Even the small budget rooms have lots of art touches such as lovely chandeliers and bathrooms. Room №13 is designed in modern style with wooden floor and minimalist furniture. 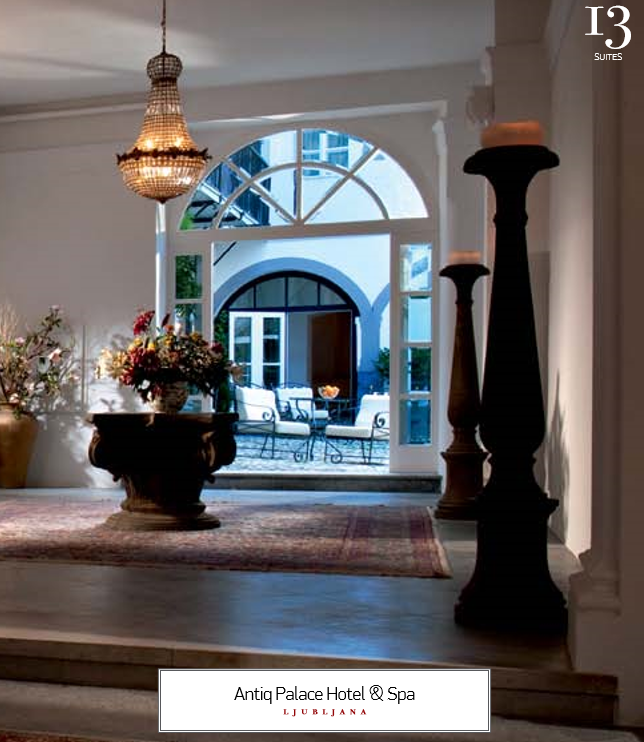 The guests of Antiq Palace Hotel & Spa can dine and have a rest in the courtyard with background music. The hotel stays warm in the winter and cool in the summer, and the rooms themselves are immense and eccentrically homey in their decor. You are greeted by a geological miracle still waiting to be explored. Santorini’s mountain ridge suddenly transforms into a small hotel that looks like a traditional Greek hotel but service-wise is anything but. And then it mutates back into the mountain and proceeds all the way down to the island’s shore. Apart from the hotel, the rock houses the plants that suffuse the air with their volatile oils, open-air pools, a breakfast terrace, a spa with an extravagantly abundant treatment menu. The views are such that to see something similar in most corners of the world you’d have needed to take a cable way or plod along mountain trails with chatty guides. The sun is relentless; hot mate is poured from a scalding bombilla. A nubile Creole girl in a long dress is darting her eyes, her cheap battered shoes covered in roadside dust, which only adds to her appeal. The picture may vary a bit, but that’s what you’ll remember. The hotel’s colonial style is definitive; don’t even try to resist its assault or to expel from your subconscious those colorful Latin American clichés. It must have been designed that way — even the strong Wi-Fi signal in all 14 rooms and the only gourmet restaurant in the city with all the specialities of the region do not detract from the otherworldliness of the interior that borders on the theatrical. Everyone knows that any Japanese city is a glass-and-concrete monstrosity. Its soulless labyrinths are filled with prematurely old centenarians, gobbling their tasteless rolls in capsule hotels. With this knowledge deep inside your brain, add another layer. 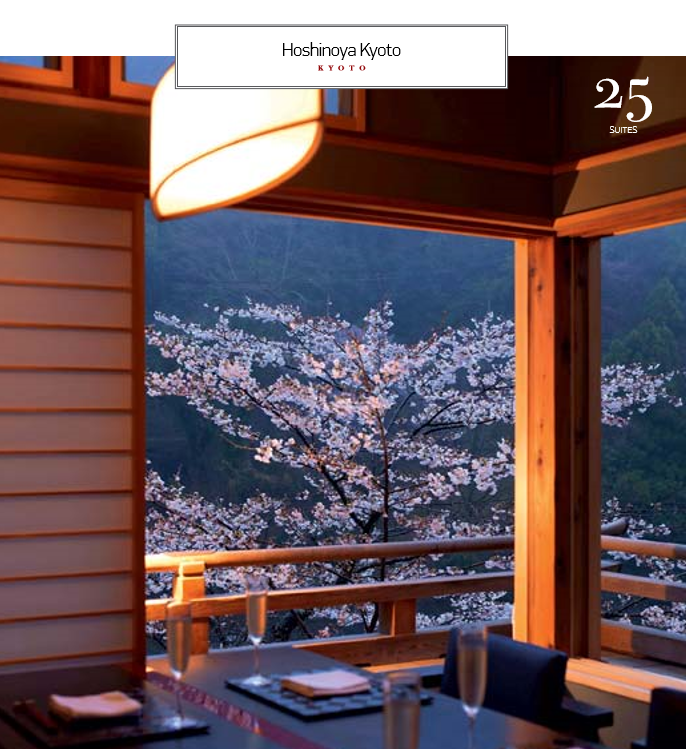 You’ll be helped by the Hoshinoya hotel in Kyoto, whose panoramic windows give off a warm glow on a spring evening from the high banks of the Hozugawa river when you approach your temporary abode in a boat — there’s no other way to reach it. Inside is a cedar tree and silent sliding glass doors; outside are the mountains, the river, and wild growth where you can spot deer or monkeys. As recently as seven hundred years ago, the calm and quiet of this place was only disturbed by the racket, din and whistles coming from the retinue of the Lithuanian prince Vytautas: this is where his lads preferred to hunt boar, aurochs and other game. These days, the calm and quiet of this place is not disturbed by anything at all. Either in rooms with a forest view or with a lake view, the only soundtrack to enjoy would be the avian avant-garde and the windy minimalism. 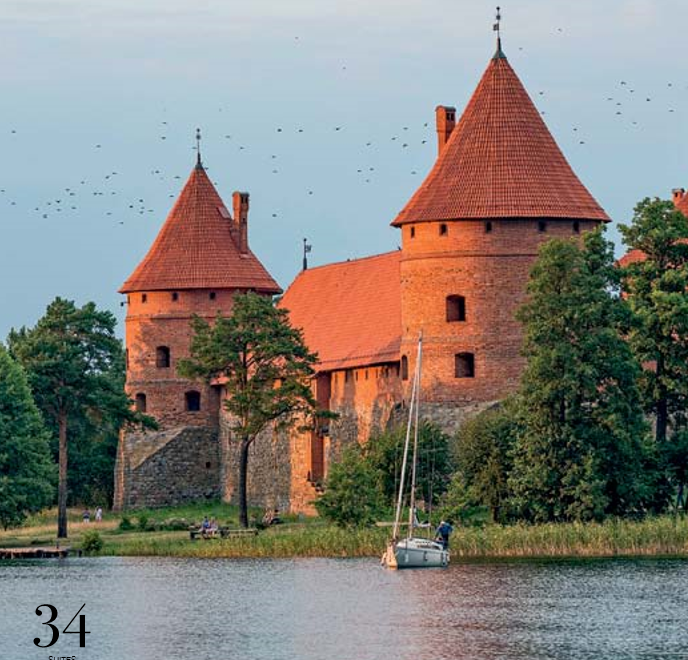 Both types of music are well suited to timber walls of some suites, mediaeval-ish canopies above beds, seasonal cuisine of La Esperanza restaurant, and the close proximity of the Trakai castle. Some guidebooks with a flair for history call Pera the Christian suburb of Constantinople. They also say that a witness to the last century of the Ottoman Empire's capital city, Tomtom Suites hotel, boasts a story that goes back to the 1850s. The house used to belong to Franciscan nuns, then to a noble Levantine family. Later, the rooms were redecorated with wood panels and Carrara marble, equipped with latter-day Turkish baths and offered to you. Having learned that, you order a Turkish coffee and addictive Oriental sweets and ensconce yourself at the table of The Bistro, one of Tomtom Suites restaurants. This modernist hotel looks somewhat like an aviary for rather small birds. The feeling doesn’t go away once you are inside. Walking along the corridors without a single superfluous detail, you’ll appreciate the designer’s taste for right angles. The gentle lightness of this quasi-aviary, however, more than makes up for its laconism. Maybe it’s the interiors with their stated neutrality, or the surrounding park with a botanical garden’s worth of plant life — trust your feelings to guide you. The sea is a long trek down, so that during the hottest hours it is more sensible to stay above and enjoy spa procedures and Portuguese cuisine. Someplace out there, the new Chinese high-speed train is hurrying to set a new record, and a crowd of pensive labourers whose own families barely recall their names, assemble chipsets for a fashionable tablet that will enhance your individuality. At the same time, Shen He Club hotel exists in some other time and space. A stone’s throw from the man-made Huahe river, almost in the centre of Nantong, there’s a mansion with attics and a demure Swiss-style tower. The interior is emphatically modern, all simple lines and reserved colours. Only the sensuous curves of wooden furniture and wickerwork railings remind you that you are in China. That, and the view behind the picture window. Such hotels are usually mentioned in the Guinness Book of Records or in bewildered Sunday TV reports, somewhere in between the talking chicken with horns and the descent of yet another UFO behind the cabin of the excited Arizona farmer. This one is similar, only it has some undeniable merits. 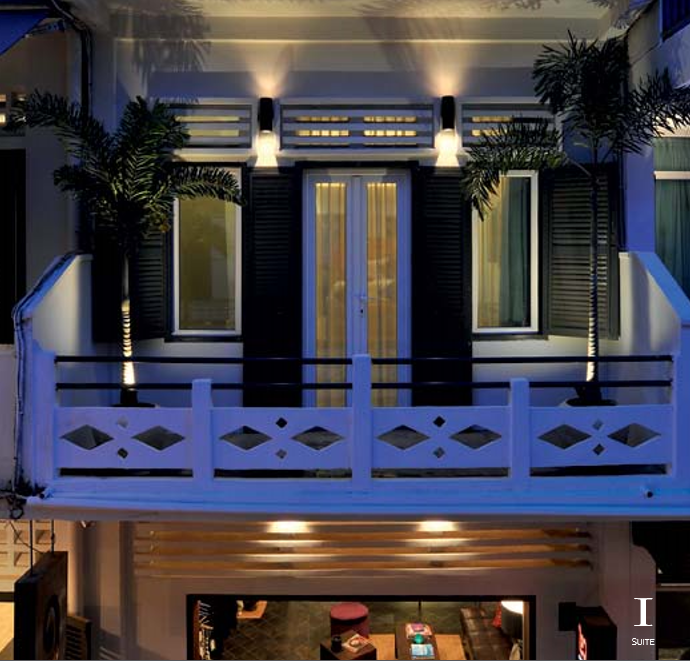 To wit: design in the best colonial fashion; sheets by Frette; a bathtub for two with underwater lighting; a jacuzzi on the terrace; spa procedures in your room. Your suite is the only one in the hotel, but it is less of a circus feat and more of a valuable feature when they bring you dinner invented by creative chef specially for you. Unadapted Maghreb legends would have left any modern person terrified, especially if someone looks up to the past in the hope of escaping from this world of cruelty. And yet, when cleansed from the insalubrious sediments of the past, the legends sparkle so brilliantly that one wants to spend more time behind the thick walls of Medina, Marrakech. And there’s more. 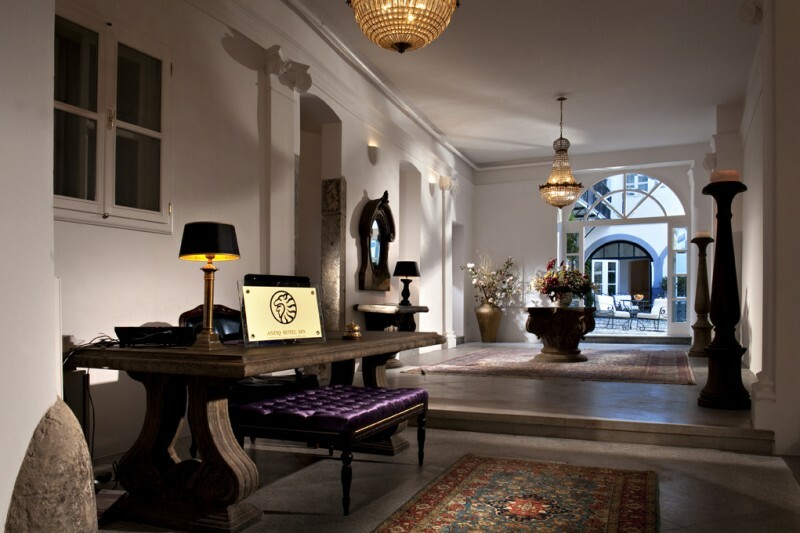 Almost every Riad possesses a number of antiques worthy of a museum. Abracadabra, however, couples that with a well-balanced style and sense of humour. Each of the eight rooms is marked by its own name, design and character. You would expect to see an Aladin, but there’s a Harry Potter and a Peter Pan as well.